James Brooks and Nathan Coleman pitch “The Elephant Pant” to investors on <em>Shark Tank</em>. 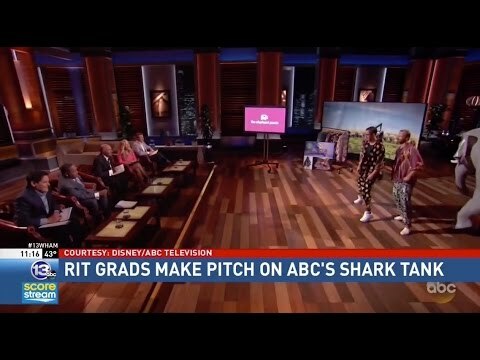 It was a wild mission to save elephants that helped two RIT Saunders College of Business alumni strike a deal on ABC’s Shark Tank last week. 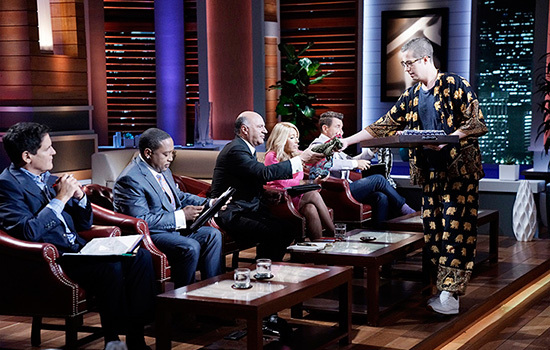 Nathan Coleman ’09 (marketing) from Ossining, N.Y., and James Brooks ’09 (international business) from Schenectady, N.Y., gave up 17.5 percent of The Elephant Pants to fashion mogul shark Daymond John for $500,000. The e-commerce retail company, which was launched in 2014, donates 10 percent of net profits (approximately $127,000) to the International Elephant Foundation. The product line targets ages 18-34 and includes harem pants, yoga pants, loungers, kimonos and jewelry. The Elephant Pants helped push the venture capitalist show past $100 million in total deals in its time on air. Familiar to RIT entrepreneurship is “Shark” John, who was the keynote speaker at Saunders College Gasser Lecture Series in 2013.